These Pope Francis sayings provide guidance to Catholics as the Pontiff shares his thoughts on a variety of topics including God, love, faith, hope, religion, mercy and the Church. Probably his greatest role is serving as the leader of the Catholic Church. With the weapons of love, God has defeated selfishness and death. His son Jesus is the door of mercy wide open to all. 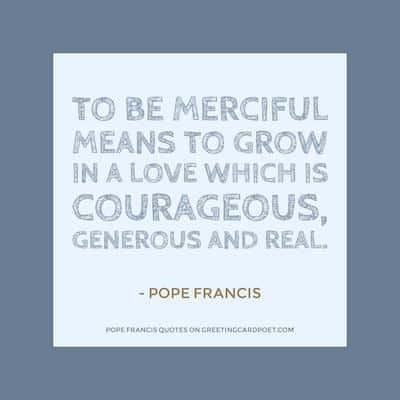 To be merciful means to grow in a love which is courageous, generous and real. 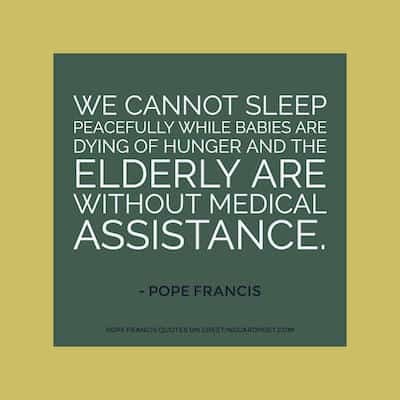 We cannot sleep peacefully while babies are dying of hunger and the elderly are without medical assistance. Being a Christian is not just about following commandments: it is about letting Christ take possession of our lives and transform them. The world needs the courage, hope, faith and perseverance of Christ’s followers. The principal mission of the Church is evangelization, bringing the Good News to everyone. The gift of the Holy Spirit has been bestowed in abundance so that we may live lives of genuine faith and active charity. When evangelizers rise from prayer, their hearts are more open. The future of our societies requires concrete action in favor of life on the part of everyone and especially institutions. God has caressed us with his mercy. 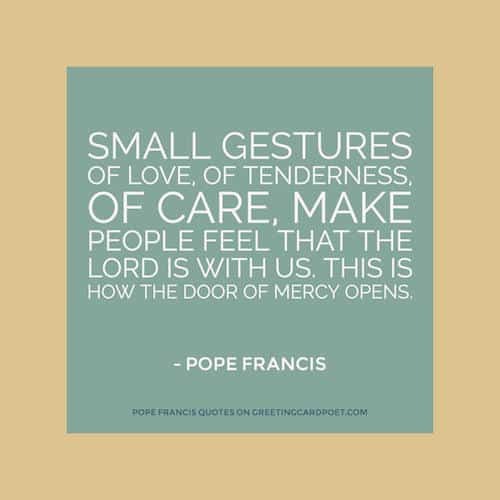 Let us bring God’s tender caress to others, to those who are in need. In a broken world, to communicate with mercy means to help create closeness between the children of God. We are called to walk together, in the conviction that the future also depends on the encounter of religions and cultures. Since Christ is resurrected, we can look with new eyes and a new heart at every event of our lives, even the most negative ones. We now live in a culture of the temporary, in which more and more people are simply giving up on marriage as a public commitment. Christianity spreads through the joy of disciples who know that they are loved and saved. Dialogue allows us to plan for a future in common. Through dialogue we build peace, taking care of everyone. We are called to live not as one without others, above or against others, but with and for others. Let us pray for the grace to never grow tired of drawing from the well of the Father’s mercy and bringing it to the world. God’s mercy is forever; it never ends, it never runs out, it never gives up when faced with closed doors, and it never tires. Jesus asks to be looked in the eye, to be acknowledged, to be loved. Yes, we are sure of it: Christ indeed from death is risen! Our hope is the Lord Jesus whom we recognize as living and present in us and in our brothers and sisters. Let us meditate with wonder and gratitude on the great mystery of the Lord’s Resurrection. Let us seek to always hold high the “tone” of our life, remembering the goal and glory for which we exist, work, struggle and suffer. If we want to advance in the spiritual life, then, we must constantly be missionaries. 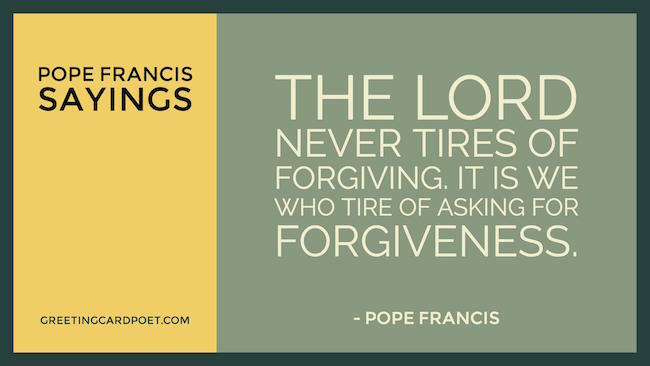 Tip: Use these Pope Francis sayings as photo captions, daily affirmations or below your sign-off on emails. May no one use religion as a pretext for actions against human dignity and against the fundamental rights of every man and woman. It is not enough to say we are Christians. We must live the faith, not only with our words, but with our actions. Christian hope is a gift that God gives us if we come out of ourselves and open our hearts to him. In every age, the Risen Christ tirelessly seeks us, his brothers and sisters, wandering in the deserts of this world. You’re on Pope Francis Sayings and Phrases – page 2 of 2 of Pope Francis quotes and sayings.